ThoughtStack is a very simple and a very lightweight mind mapping software for Linux, Windows and Mac. It can be used for organizing your mind and thoughts. Every idea that pops into your head can be easily added to the “thought stack” from where you can develop it by adding children several levels deep. Example of a ThoughtStack mind map can be seen in the bottom right corner of the screenshot below. 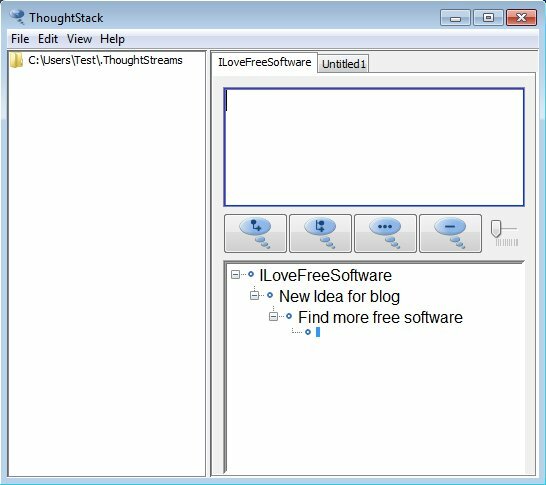 We have one thought stack called IloveFreeSoftware Ideas and from there we started development by adding sub-thoughts using the buttons which you can see just above the mind map. Text field in the top right corner is for describing the ideas that you add to the mind map. Left sidebar is a file browser which you can use to open up saved mind maps. Similar software: Free Mind, The Brain, FreePlane. Allows you to setup and develop mind maps, ideas, thoughts, etc. In todays hectic world, we’re always thinking about something, and most of the time what we’re thinking about isn’t that important. Random thoughts about everyday events will eventually cause you to start forgetting important ideas for school, work, and so on. That’s exactly where mind mapping software comes into play. Mind map is created right away after starting ThoughtStack. Java runtime has to be installed before your run this free mind mapping software, if it’s not you’ll receive errors. 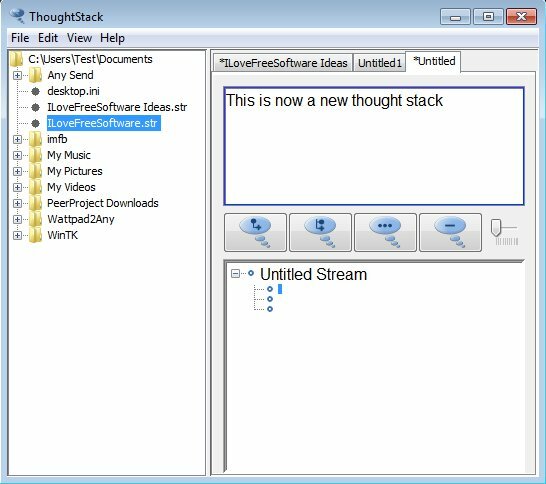 Additional mind maps, which are called Streams can be created by selecting File >> New Stream. They’re gonna appear as new tabs on the right, just above the text editor where you can describe the idea that you’re developing down below. To have the list of directories which you can see on the left, you’re gonna have to select File >> Set Home Directory. When you’re developing ideas and thoughts, you need to use the buttons which are indicated with arrows on the image above to add either a new main idea or a child idea so that you can develop the main idea more fully. Let’s say that you thought up of a great new marketing scheme. Set it up as your main idea and after that created additional sub-ideas, which can go several levels deep. Select File >> Save to save your mind maps to edit them later on. Unlike a lot of mind mapping applications that we talked about up until now, ThoughtStack is very easy to use, which is great for those who are looking for simplicity when it comes to their mind mapping software. Everything worked as advertised. If you’re having troubles keeping track of all the ideas that pop-up in your head, this is the tool for you.